Momo Traders: Tips, Tricks, and Strategies from Ten Top Traders is a book about successful day traders in stock markets. It was written by Brady Dahl and co-authored by Nathan Michaud. It is an interview book where best day traders (deemed such by the author) talk about their path to success and their way of trading. The book has a preface written by Brett N. Steenbarger — a rather prolific writer of books on trading psychology. Brady Dahl worked as a writer for the first seasons of Sons of Anarchy TV series. In addition to writing, he is also a trader since 2008. Nathan Michaud (Nate) is a co-author of the book and is also one of its subject — the 9th trader interviewed by Brady. He is a successful stock trader with a lot of experience dealing with penny stocks. He is the owner of the traders’ community Investors Underground, which is often mentioned throughout the book. One of the book’s selling point is that a part of its sales’ proceeds will go to Traders4ACause — a non-profit organization that distributes its donations to various charities. The organization is managed by Nathan Michaud, who is a contributing author of this book. Traders4ACause supported such charities as GiveWell, Breast Cancer Research Foundation, and others. It is a nice thing that high-profit traders unite to support honorable causes that require funding. The road to success starts with failures. Failures are natural and they will help you in becoming a better trader and a better person overall. Do not be afraid of failures and do not stop at them. Blind following of other people’s trades and signals is not a road to success. Meanwhile, reading about other traders’ ideas and reasoning, analyzing them, and drawing your own conclusion will contribute to your success. You need money to trade and to live. If you are going to be a part-time trader, you will have some other source of income to cover your daily expenses. But if you attempt to jump into full-time trading, you need to have enough capital to fund your trading account and to pay your bills and to buy groceries. Also, having enough money means that you are more flexible realizing your trading strategy — taking an adequate number of positions of an appropriate size. Establishing a routine is very important for intraday traders. Successful traders rely on discipline, and significant part of it comes from the well-structured and organized daily routine that they have established for themselves. It is one of the simplest things to mimic, and I recommend you to do it as soon as possible if you are serious about trading for a living. Understand the risk-based nature of trading. Any kind of financial trading is probabilistic. It means that once you reach a certain edge against the market, you control the situation by managing your risks properly — taking just enough risk to increase your balance progressively but not too much to avoid the account blowout. Never stop learning. The markets evolve, and the good traders evolve with them. To become a better trader, you have to improve your skills, study literature, and try new methods. Without that, you will stagnate and fall behind. I hate to mention it, but the book is quite repetitive despite being composed mainly of the thoughts and opinions of ten different people. By the end of the book (8th and 9th interview for me), I could guess what the answer will be to 4 out of 5 questions. Perhaps, it is because the traders come from the same online community, but it really makes a big part of reading quite uninformative. It seems like every trader is lacking in fundamental analysis field and is planning to learn it someday but does not do it for this or that reason. All of the interviewees have 3 to 5 monitors on their desk to analyze the stocks. And most of them seem to be full of scorn for Twitter gurus. That would not be much of an issue had there been more diversity in the questions that Brady asked. At the same time, that could have been intentional to make the similarities between the successful traders to stand out for us. 10-Q — a quarterly report filed with the SEC by publicly traded companies. After hours — a low liquidity limited stock trading session between 16:00 and 18:30 EST, just after the market closes. Boxing — going long and short on the same stock simultaneously (akin to Forex hedging). It enables a trader to go net short when there is no short liquidity available but ties up more capital (double amount) and drains more trading fees. Filing — a filing of public company’s financial statement with the SEC. Contains important data on the company. Momo — momentum trading or someone who engages in momentum trading. Montage — a display of some trading data in the trading or charting software. OTC market — an over-the-counter marketplace for small-cap stocks that are not traded on NASDAQ or any national stock exchange. Parabolic move — stock rallying up akin to the right wing of parabola. Usually, happens when some small-cap stock is promoted. Pattern day trader rule — a set of rules imposed by FINRA on traders who execute at least 4 intraday stock trades within 5 business days on margin account. Enacted on February 27, 2001, it requires such traders to keep at least $25,000 equity in their accounts and respond to margin calls in timely manner. The SEC does a very good job explaining it. PR — a press release about a public company, containing some information pertaining to that company. Premarket — a low liquidity limited stock trading session between 8:00 and 9:30 EST, just before the market opens. Promotion, promoter — some stocks are getting hyped up to inflate their value, usually as a part of a pump and dump scheme. Pump and dump — a stock trading fraud when a promoter ‘pumps’ the price by heavily advertising it with false or misleading statements and then ‘dumps’ it when enough victims have bought the stock. Usually, the scheme operator promotes the stock via email spam or through the social networks. Scan, scanner, scanning — automated alerts based on indicators. Usually, scanners use chart-based technical indicators but scanning using fundamental indicators is also a thing. SSR (Short-Sale Rule) — a rule by the SEC that prevents shorting some equities that dropped more than 10% during single trading session until the end of the next trading session. T+3 — trade date plus three days — an execution model that requires the contract to be settled in no more than three days following its purchase. In stock trading, it means that a position opened as T+3 should be closed within 3 days after opening. All interviews are quite similar. Of course, there are differences, but all ten interviewees have so much in common that after reading the book, you easily forget, which one was who. See the Recurring themes above. Sometimes, the book looks like an ad for services by Tim Sykes and Nathan Michaud. I understand that some of the interviewees owe a lot of their success to these people, but the book could be less annoying about it. The physical book itself is very inconvenient to read. I call such books self-closing paperbacks. You cannot just open a page and leave it lying on the table at that page. It is a shame that no electronic copy is available. The price is rather steep. For example, you could get Trading in the Zone, which I would call a much more useful book, in hardcover and for a lower price. Of course, part of proceeds are going to charities in case of Momo Traders, but offering a Kindle version at some discount would be a definite solution to the price problem. Should you buy this book? If you are already interested in stock day trading or if you are planning to diversify from Forex trading, then this book can surely help to set you on a right path. However, if you are a currency trader who does not look forward to venturing into other financial trading niches, Momo Traders will be of little use to you. Yet you may like reading it for general education. 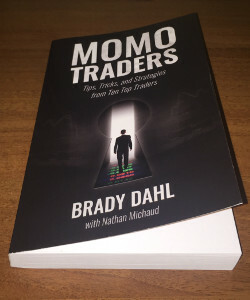 If you have any questions, comments or opinions regarding Momo Traders by Brady Dahl, please feel free to post them using the commentary form below. Thank you for bringing this one to my attention. It looks good so I’ll give it a look.